How do we escape the 9-5 shackles of corporate drudgery to build a life of adventure, meaning and purpose? Can we do this with $100 (or less) in our pocket? The answer to both questions is yes. At least according to Chris Guillebeau, author of “The $100 Startup: Reinvent the Way You Make a Living, Do What You Love, and Create a New Future“. From a pool of over 1,500 small business owners who built businesses earning US$50,000 or more from a modest investment (often US$100 or less), Guillebeau’s book focuses on the 50 most intriguing case studies. With the key themes of freedom and value at its core, “The $100 Startup” is a brilliant blueprint assisting “wannapreneurs” keen to heed the rallying call of the microbusiness revolution. Espousing that borrowing money and debt are optional, the book proposed that entrepreneurs starting such businesses were more interested in the lifestyle it offered rather than making oodles of cash. By bootstrapping, bartering, reducing overheads (rental and manpower), and leveraging technology (especially the web), one can start one’s own business almost on a dime without being beholden to creditors or venture capitalists. Let me cover the salient points of the book. To improve the chances of start-up success, we’re taught three key philosophies. First, we should focus on businesses that converge with both our passion and what people are willing to pay for. Second, we should examine how our competencies (eg a teacher’s ability to do planning and manage people) can undertake “skill transformation” to suit a specific business. Third, we should ensure that there is alignment between our passions, skills, and what people want. Passion or Skill + Usefulness = Success! To create true value, we should give people what they truly want, and not just what we think they want. In other words, we should give them “the fish”. Dig deeper to uncover hidden needs, latch onto popular hobbies or passions, make our customers heroes, and sell what they’ll buy. Restaurant: From “Food and drinks” to “Relax and let us take care of you after a busy day”. Software Developer: From “App developer” to “We provide technology solutions to take your headaches away”. Once the above is achieved, Guillebeau detailed several practical steps on bringing it together. Most of these take the form of a one-page plan which covered stuff such as the following. First, we should become an information publisher (kind of like me here) by finding a topic that people will pay to learn about. Capture our content (text, video, or audio), package the materials into a product, price it appropriately, and publish it. You could also position yourself as an instant consultant. Pick something specific (not general) and charge a fair rate. You can download a free template here to see how this can be done. Develop a one-page business plan. This should include what you will sell, who your customers will be, how much you will charge, how you’ll market your business, what determines success, and how objections will be managed. You can download a free template here detailing how this can be done. Overdelivering aka “Wow, look at all this extra stuff I didn’t expect”. To launch one’s business, creative and innovative ways should be considered. Centred on enchanting storytelling, a good launch strategy can be broken down into a 39 step product launch checklist (another free download here). Hustling (aka marketing) or the art and science of promoting oneself is also covered. Here, we are advised to combine style with substance to achieve impact, and to embrace strategic giving by providing a valuable service which helps people while building relationships. The key is to spend 50% of your business development time on creating. The other 50% should then be spent on connecting with others. Check out the free promotion plan to decide how. The book also covered ways to raise funds and increase profits. From borrowing from family members to Kickstarter to car loans, there are various ways to reduce one’s startup burden. The point here is to keep one’s liabilities to a minimum. Get paid more than once (ie the subscription model). a) Increasing traffic and conversion on a website. This may involve conducting A/B testing to see which works better. b) Increasing average sales prices by upselling (“Would you like fries with that?”), cross-selling (offering related items after purchases are made), and sales after the sales (special offers immediately after the sale). c) Selling more to existing customers. d) Creating a Hall of Fame to shine the spotlight on customers while providing social proof. g) Introducing powerful money back guarantees (eg 110% guarantees) or making a big deal aboutoffering no guarantees. To multiply one’s efforts, one could use a “hub-and-spoke” model of maintaining a home base while using other outposts to diversify oneself. One should also determine if outsourcing to virtual assistants, subcontracting and hiring employees would truly work. Naturally, there are pros and cons to each, and these are covered in detail in the book. Partnerships such as affiliate programmes may also work. However, the author advises that a more generous commission scheme for affiliates may work better in attracting higher quality partners. Finally, to sustain one’s entrepreneurial efforts, one should decide whether to stay small as a solopreneur or grow one’s business. We are also told to “work on our business” instead of just in our business (hat tip to The E-Myth Revisited). This entails reviewing aspects like business development, offer development, prices, and customer communication, and monitoring one or two key metrics (eg sales per day, sales conversion rate, leads per day, etc). Stuffed with fascinating stories of individuals who uprooted themselves from corporate comfort to embrace micro entrepreneurial ventures, The $100 Startup inspires as much as it instructs. They include Jen Adrion and Omar Noory, who gave up corporate jobs to sell custom-made maps out of an apartment, James Kirk, who uprooted from Seattle to open an authentic coffee shop in “tea and biscuits” South Carolina, and Kyle Hepp a wedding photographer who travels the world from her home base in Chile. Positioned as a guide for bootstrapping solopreneurs, the book doesn’t dive deeply into any one specific domain. Skewed towards online-based businesses, however, it does provide useful tips for location-independent businesses keen to embrace the capabilities of the web and social media to improve reach while reducing costs. To conclude, I’d probably place”The $100 Startup” together with other hallowed volumes for start-up entrepreneurs in the digital age. 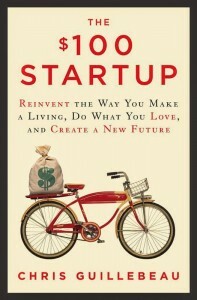 These would include other cardinal reads like Launch, The Lean Startup, The 4-Hour Work Week, and The E-Myth Revisited. A definite must-read for anybody keen to embark on their own entrepreneurial adventure. Like me!